Ubuntu Jaunty installs Python 2.6 by default so that's not a problem. 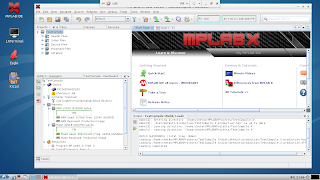 According to SimpleParse author Mike Fletcher, the current source of simpleParse includes mxBase tools so getting them from eGenix is not necessary. So in all, we just have to install SimpleParse and then install Gerbmerge. Before we install SimpleParse we have to install a few packages from Ubuntu repository. According to the author, get simpleparse from bzr release. CVS snapshot and the latest release don't work. The above instructions will install and test SimpleParse. After installation, Gerbmerge doesn't run as it can't find site-packages/gerbmerge so couple of soft-links are needed. The prerequisites build-essential, bzr etc. can be removed at this point if needed. Now you should be able to run gerbmerge from console. Thanks a lot for taking the time to post this. It works! Worked for me, too. Thanks for tracking down the bzr/launchpad release mojo! Thanks all. Recently gerbmerge has changed hands. It seems that the newer version doesn't work on new ubuntu out of the box. I have a patch + instructions ready for it. I'll try to post them soon. I get the same problem as above user. Which Ubuntu release are you using? have you seen my other post about installing gerbmerge on 12.04LTS? The download link does not work any more. Do you have a good link for version 1.8? At http://www.gedasymbols.org/user/stefan_tauner/tools/gerbmerge/doc/ they have an older version (1.7a) available, for what it is worth. "Anonymous" pointed out that the link to download gerbmerge source was broken. I contacted the author and he/they provided a new link. I have updated the link in the post.